This week’s loss was staggering. I did not expect to lose so much this week, but I did: an average of a pound a day. Seeing the number I saw on the scale this morning, I couldn’t believe it. I haven’t lost weight like this since immediately after surgery. I stepped on the scale this morning and stepped off again, as I do every week because I don’t believe the numbers that I see when I step on. I weigh at the same time on the same day each week to maintain consistency in measurement, even when I’m traveling (we pack the scale with us when we know we’ll be gone through a Sunday). 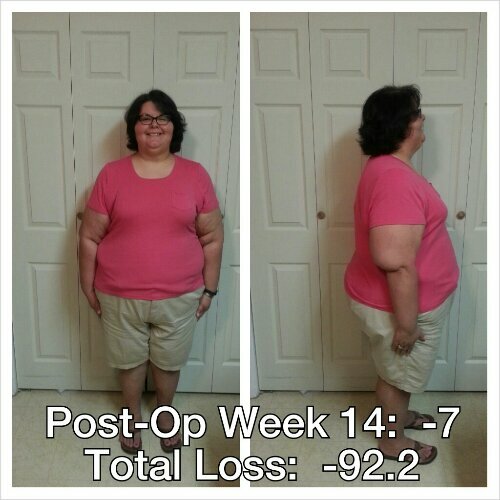 Today’s weight marks 55.2 pounds lost from the surgery alone, so an average of about 18 pounds a month since surgery. Not too shabby! But today’s weigh-in has me filled with mixed emotions. First, I’m just shy of a major weight loss milestone: -100 pounds. This loss will put me in a weight century I haven’t seen as an adult: the 200’s. I’m excited about both of these things, because I now weigh what I weighed when I graduated high school nearly 23 years ago and I’m pretty sure I’m in better health now than I was then. Second, I will hit one of my personal weight loss goals before the deadline I’d envisioned it would happen. I told myself I’d like to be below 300 before Thanksgiving. Now it looks like I’ll be there before Halloween, which is awesome in lots of ways. This also means it’s time to refine some of my goals since I’m hitting them earlier than I anticipated I would. I am hopeful that at my 6-month follow up appointment, my doctor is going to be blown away at how well I’ve done so far. That’s what I’m aiming for, anyway. Third, I’m fast approaching a fitness goal I have set for myself. I told myself once I got down to 280 that I would start a running program. Whether that is Couch to 5K or Luke’s Locker’s 9 to 5K program is yet to be seen. The next 9 to 5K program starts in the spring as the fall class has already started. My issue with the spring class is that it is still very cold outside, and I get hives when I am exposed to cold temps for very long, no matter how warmly I dress myself. I may just start off with the Couch to 5K program and see how it goes. I need an accountability partner for this, so if anyone is willing…in about 6 weeks or so is when I anticipate being able to start. This assumes that weight loss is continuous, that there are no gains and that there are no stalls. Finally, I’m apprehensive about how this week will go. I’d written yesterday about how I think that I’ve found my weight loss “sweet spot”–the place where protein, calories, water, and activity converge to produce weight loss. I dropped 7 freakin’ pounds this week. I am pretty positive that next week will not show such a great loss. In fact I’m nervous that at worst, I’ll have a gain, and at best, I’ll stay the same. This week, I’m on the uphill climb to Hormone Hill and things tend to slow down loss-wise during this week and the week following it. I can already tell I’m starting to retain a little water because certain body parts are getting to be tender and certain clothing items are starting to fit a little more snugly. I just need to keep doing what I’ve been doing and see how my body responds in return. I can’t worry about what hasn’t happened yet. So perhaps I shouldn’t think about what my scale will tell me next Sunday until after I’ve eaten, walked and drunk all my water each day of this upcoming week. I will share an NSV with you all though. My wedding band and engagement ring are badly in need of a ring guard. See? Today’s eating is shown below. I got in protein like a boss today: 96 grams. I find that my body is happiest when I get between 80-100 grams. 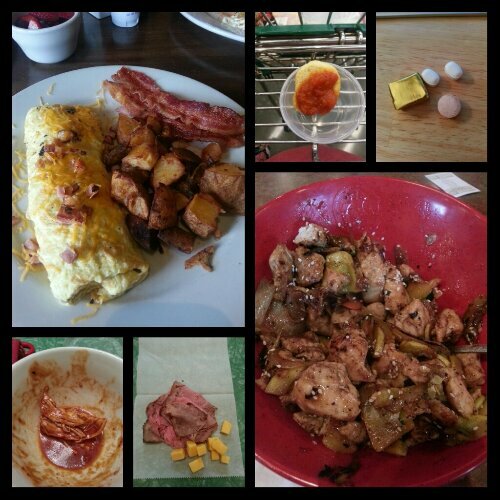 Today’s food choices, from upper right: multivitamin x2, calcium and iron supplements; leftovers from a chicken, zucchini and onion bowl from Genghis Grill; Central Market sliced roast beef (I didn’t eat the cheese shown); rotisserie chicken breast meat with a tablespoon of barbecue sauce; ham and cheese omelet, bacon and a few home fries (I have leftovers for breakfast tomorrow, yay! ); a crostini with a teaspoon of Beekman’s “Mortgage Lifter” heirloom tomato pasta sauce. This entry was posted in daily bites, eating, goals, la guerra, NSV's, post-op, progreso, vsg, weight loss surgery, werk! and tagged benefits of wls, daily bites, fitness goals, goals, little celebrations, NSVs, photo post, post-op eating, post-op life, progress report, sorry for sleeve rocking, success, VSG, vsg realness, weight loss goals, WLS. Bookmark the permalink. Yeeee haw! The pics just blow mw away! You look so good! Even if there is a little gain or plateau this week, it will not be permanant. You will never go back to what you left behind. Loss IS the path you are on! Congrats!! I know what you mean re: the wedding rings. Both my engagement ring and wedding ring are a size 12 and I haven’t worn them in months. I had a plastic ring guard, but then that wasn’t helping enough anymore! 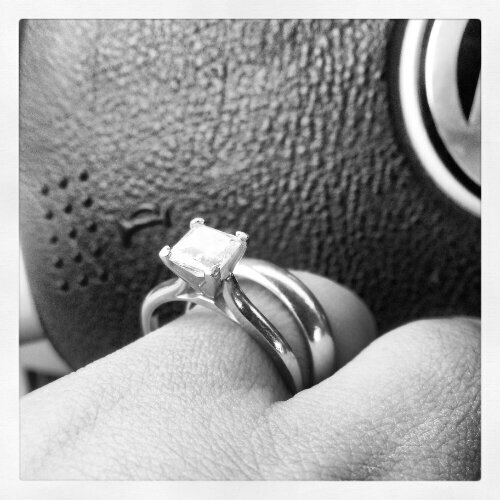 Can’t wait to get them resized someday! Congratulations! You’re dedication is incredible! And you motivate me to find my sweet spot for my weight loss which is something I’ve be neglecting! Keep up the good work!